I love the smell of sampaguita. When I, my brothers and my sister were just children, we have a large shrub of sampaguita grown in our front yard, just beside the wooden gate and with all the other trees, and flowering and vegetable plants. 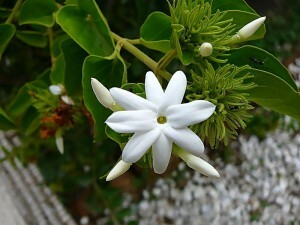 The white flowers’ sweet scent would perfume the whole yard, especially in the early morning and on the month of May. Today, we’ve lost all our trees and shrubs in the front yard, except for one that’s still standing at the backyard. And also today, it seems sampaguita could just be seen on the streets being sold outside churches, worn as garlands by graduates and for guests, and is placed on religious symbols. Thus the reality of that old but very wise verse. In a feast, everyone seems happy, enjoying everything life has to offer on that event. Everyone seems to be full and satisfied. An introvert person might shy away from all the crowd and noise. A sad atmosphere isn’t even welcome in such place. 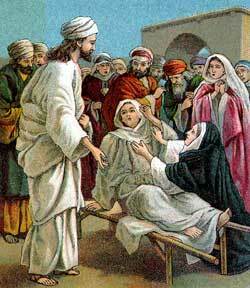 “The woman of sorrow meets the man of sorrow and the woman’s hurts in life became the very experience of joy.” (Ptr. Doy Castillo) She was never alone again because of Jesus. But it’s different in a funeral. There is gloom, but there is also genuineness of feelings. Someone wouldn’t feel ashamed of crying, even if he’s no kin to the bereaved. People won’t ask you why. In the funeral I’ve been to, the late mother had lived for 95 years. That’s a lot, because Moses said, “The days of our lives are seventy years; And if by reason of strength they are eighty years…” (Psalm 90:10) The 15 years were like a bonus from God! On that night they celebrated a life fully lived. On that night, families were reunited. In gatherings like this, laughter isn’t restricted. Maybe that’s really a fact: it’s better to smile or laugh after crying, than the other way around. Not because it’s a break-up or moving-on song, but because it clarifies that I’m still strong even when all the people I may even know are not beside me; though they could or would not be here with me, it’s still okay. “Just me, myself, and I,” but I want to alter that into “Just me, myself and God.” In my lonely times and seasons, God is always in me and with me; sometimes I’m just too proud to realize or acknowledge it, but He never changes. He still comforts and cares for me. Everything I wanted in a friend is in Him– He’s the Perfect Friend and Companion. That’s why I know I’m not alone. We must cherish our families and loved ones because they are gifts from God. Cherish the ones, though they’re few, but have been there for you and truly understand you. In life it’s not important how many people we know, but how many have been touched by our living. We must also aim to live a life that someday will be celebrated because it’s both good and faithful in knowing, serving and loving the LORD. In Him there’s no insignificance.